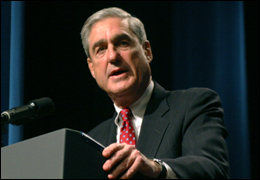 WASHINGTON — A slice of history in Washington that included FBI Director Robert S. Mueller III is gone. The Friendship Barbershop at Wisconsin Avenue NW and Newark Street, where Mueller got his haircuts — shut down Feb. 26 to make room for a redevelopment project, according to WTOP radio. Not to fret though. WTOP reports that the owner of the shop, Luigi Sacripanti is moving his operation to a friend’s salon on Cathedral Avenue NW in the District. Mueller, who retires from the FBI in September, enjoyed some celebrity status at the old shop, WTOP reported. His framed photo hung on the wall, and Sacripanti, would shut down the shop while some dozen of Mueller’s staff stood around and watched. Posted: 3/4/11 at 9:33 AM under FBI, News Story.